So, back to my kitchen. My ORC might be a little different from the other 20 bloggers in the simple fact that I am a renter. I won't have brand new cabinets, new appliances or even new hardware (mine are PAINTED on, ugg) at the end of this challenge. As much as it pains me, it's just not possible. But like lots of other renters out there I still want to make my apartment feel like home and have some personality. A one year lease quickly turned into 5+ years so take my advice, make that rental your own ASAP. Not great, but not horrible. 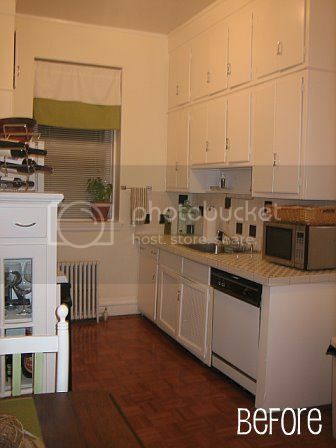 At least I don't have those oak/laminate cabinets like many Boston rentals have (Landlords, WHY??). The table and chairs aren't new and they aren't getting replaced, I still love them. 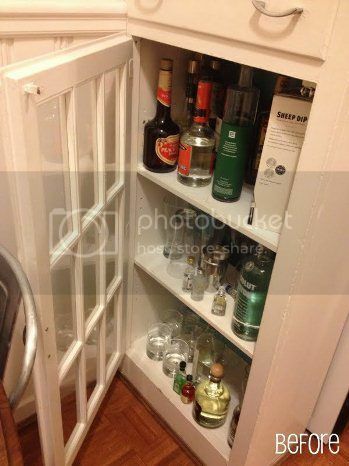 You can also see the back door in this photo, it never gets used and it's a great wall for more storage. ...needs a makeover BIG time. -more storage: Yes I have lots of cabinets but there still doesn't seem to be enough. -color and more color: I'm technically not allowed to paint, so I've got to be creative on how I add it. I love everything about our rental kitchen except we have the aforementioned oak/laminate cabinets. They are SO hideous. And there's a really special multi-color tile backsplash to go with it. No bueno. What an important room to redo! How great that you'll have this done so you can enjoy the space more. Can't wait to see what you do -- I know it will be fantastic! Can't wait to see how this transforms and really excited to see that it's a rental so you'll be working with the bones ya got! So excited to follow along! I can't agree more that it's so important to make a rental feel like "home". 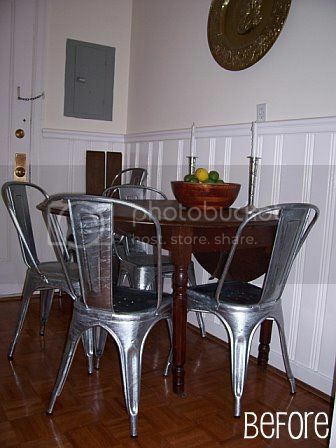 Such a great space to redo, it's so hard in a rental, it will be fabulous inspiration for those in the same situation! I love your makeover plans and really looking forward to following along.. Best of luck sweetie and I hope you don't stress too much! You are not the only renter, and as you said... SO MANY PEOPLE are renting along with you. I have the same "most important cabinet" in my kitchen. I'm thinking you need to up a sign "Break glass in case of emergency" sign on it. Love all your DIY's so I can't wait to watch you work. I did my kitchen for the last ORC so I am looking forward to following this. Love the ORC! 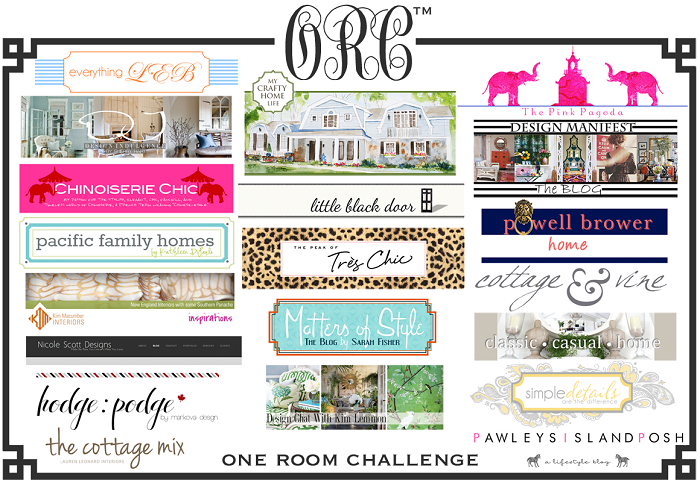 Can't wait to see what you do with your challenge of a rental space! That's a great space, I think, to do some really fun stuff with. Maybe temporary wallpaper? And that drop leaf table is devine! Can't wait to see what you do! We could all use a good lesson in how to update rentals - especially kitchens. Cannot wait to see where you go with this. I always love what you do! I'm really looking forward to your ORC makeover. I've already seen your creativity so I'm excited to see your kitchen. I love seeing what people do with small spaces! Your kitchen has great bones! Can't wait to see! This is going to be so charming...can't wait! Making me thing I need to do some organizing, too. So glad Linda harassed me into do this again....it forces me to get back to reading blogs again....I have been so slack lately. Excited to see what creative things you come up with in your kitchen! This is an amazing project. There are so many renters out there that could and should spruce up their kitchens. Can't wait to see these little transformations. When I did the challenge both times I was a renter... you can totally do it! Can't wait to see the transformation! Good Luck. I can't wait to see what you do with your space! I really enjoyed what you did last year and now can't wait to see what you do in your kitchen. It is adorable as is and yet has so much potential. Guuurl, you've got your priorities in line! Can't wait!